Ballintubber Abbey was founded by King Cathal Crovdearg O’Conor – Cathal Mór of the wine-red hand. He was of the royal race of the O’Connors, King of Connacht and notable patrons of the arts. The Cross of Cong, one of our national treasures, was designed for his father, Turlach O’Connor. Though there are many references in the ancient annals to 1216 as the year of its foundation, the circumstances are shrouded in legend. Cathal was the natural son of King Turloch. Before he ascended the throne of his father he was in flight from the vengeance of Turloch’s queen. Local folklore tells us that during this period he had been working in Ballintubber for a man named Sheridan, who treated him with the greatest kindness. Leaving Ballintubber, Cathal vowed that he would never forget the kindness shown him there. Years afterwards, when Cathal ascended the throne of his father, he paid a visit to his old friend. The king asked him if there were any favours he could do in return for the kindness shown him in the days of exile. Sheridan told him that he was now old and that he wanted for little in this world, but if the king would restore their old church which was collapsing, he would be eternally grateful. Cathal promised that instead of repairing the old church he would build a new one. The years went by, and on his next visit the king asked the old man how he liked his new church. Sheridan reproached Cathal for not keeping his royal word, but the king asserted that he had given orders for such a church to be built. On investigation it was found that a church had been built, but in Baile tobair Bhrighde, Roscommon, instead of Baile tobair Phádraig, Mayo. And the story goes that the king vowed to build another church seven times more magnificent in Ballintubber, Mayo, and that is how Ballintubber got its abbey. The old church beside which the Ballintubber Abbey was built was a Patrician Church. In fact Ballintubber takes its name from St. Patrick-Baile tobair Phádraig – the townland of St Patrick’s well. Before that the area was known as Bail Craobnach or Creevagh. 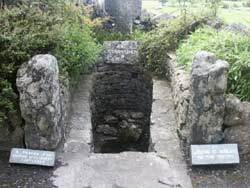 Close by is the well where Patrick baptised his converts in the district, with a stone alongside bearing the supposed imprint of the saint’s knee. Tobar Padraic, as the abbey is called in the Annals of the Four Masters was founded for Canons Regular and dedicated to the Holy Trinity. Strictly speaking the canons were not monks, but secular priests living in community following the rule attributed to St Augustine. Their primary work was the care of souls. According to tradition only men of noble birth were admitted, a fact which may account for the immense estates which in later years, the abbey possessed. With the passage of the years the abbey flourished. It had a dependency or cell- the priory of Cross of Holy Cross, in the parish of Kilmore-Erris in North Mayo Holy Cross was founded on the site of an earlier monastery dedicated to St Brendan. A red sandstone inserted in the south transept wall of Ballintubber Abbey bears the inscription “GILLABAR – the servant of Brendan”. 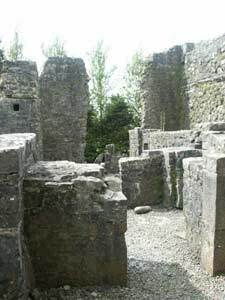 There are several referrals in the annals of Irish History to the abbey of Tobar Patraic. The annals of the Four Masters tell of the burning of part of the Abbey in 1265. It would seem as if this burning was confined to the nave. This part of the church was rebuilt in 1270 and even today differences in the style of the building may be noticed. In 1536 legislation was passed in Dublin dissolving Monasteries. But outside the Pale, such legisation was very difficult to enforce. The same applies to Elizabeth’s time. However, James I in 1603 confiscated all the lands belonging to the Abbey and effectively ended the presence of the Canon Regulars in the Abbey. From 1603 to 1653 the Augustinian Friars (a mendicant Order) may have been in charge of the Abbey. Their presence ceased there with the burning of the Abbey in 1653. The burning of the Abbey in 1653 by Cromwellian soldiery marks the second attempt to destroy Ballintubber Abbey. The Cromwellian assault was only partially successful. The monastic buildings, the dormitories, the cloisters and domestic quarters seem to have been completely destroyed. The Abbey church again escaped total destruction. All of the timber roof was consumed in fire, but the internal stone-vaulted roofs of the chancel, the four side chapels and the old sacristy remained intact. But even Cromwellian despoliation did not put an end to divine worship in the Abbey. Mass continued to be said there as it has been said for almost 800 years. No record of the history of Ballintubber would be complete without mention of the notorious priest hunter Seán na Sagart – John of the priest. His name was John Malowney. Tradition say he became a priest hunter when he was caught stealing a horse. The penalty for this ‘crime’ was hanging. However, on the night before the hanging Bingham, the Sherrif of Mayo, made a bargain with him – he would have his freedom provided he paid a certain rent each year – “a priest’s head”. It was Penal Times, when for political more than religious reasons, teachers, priests and bishops had a price on their heads. It is said that Seán was responsible for the capture of a good number of priests. He had protection of the soldiers wherever he went. There were two priests in this area but Seán could get no trace of them. He tried a trick. He went to his sister Nancy and pretended he was dying and he wished to confess his awful crimes and be forgiven before he met his Maker. 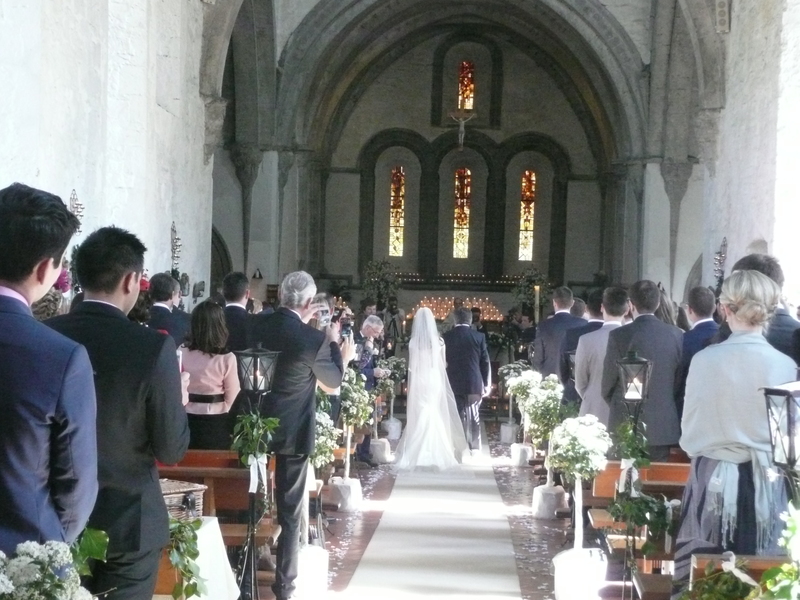 Finally, Nancy believed him and sent for the older of the priests – Fr Kilger. But as Fr Kilger was bending over him hearing his confessions Seán stabbed him in the heart with the dagger he had hidden under the blanket. Next day they brought the body of Fr Kilger to the graveyard for burial and the other young priest came to bless the grave, disguised as a woman. Seán recognised him but before he could kill him the young priest, Fr Burke ran. The chase lasted all day until finally in Hession’s field near Partry the priest stumbled, and Seán flung the dagger and caught the priest in the leg and incapacitated him. Seán was about to kill the priest when a peddler (John McCann) who had followed them came up and shouted to the priest to pull the dagger out out of his leg and he in turn attacked Seán with his own dagger. The soldiers found the body of Seán na Sagart next day and buried him in the graveyard in Ballintubber. But the people of the area took his body out of the grave and threw it into the local lake. The priest who hand now fled ordered them to drag the lake for his body and to bury it in the graveyard. The people did find the body and buried it in the graveyard. But they didn’t bury him facing the east and the rising sun as all the other dead lie in waiting for Christ to come again in glory from the East. No, they buried him facing the north, where the sun never rises. An ash sapling grew up and became a tree and split his grave in two. 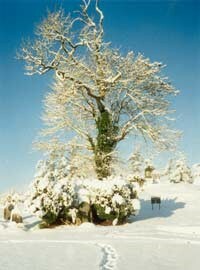 That tree can still be seeing standing in the grounds of Ballintubber Abbey today and it is known as the “Seán na Sagart tree” Go ndéana Dia Trocaire ar a anam. The first effort at restoration of the Abbey church was made in 1846. 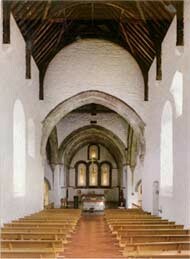 It was then the intention to re-roof the nave as well as the transepts. The disastrous famine came in 1847 and the population of Ireland fell by millions and all work on the Abbey had to cease. Forty years later another generation resumed the task of restoration. Help and assistance came from many quarters, from people who had no connection whatsoever with the parish. Restoration of an Irish Abbey, then seven centuries old in which the praises of God had never ceased, even during the Penal days, captured the imagination of the public and tugged at the heartstrings of exiles all over the world, proud of their Irish heritage. We can still read letters from those of Irish blood in America, Australia and far-away New Zealand who had read of the work of restoration and hastened to help. 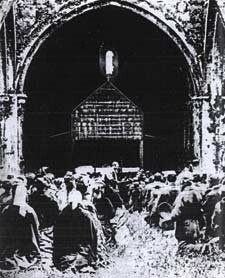 In 1966, under the direction of Fr Tom Egan the nave of the Abbey was restored and roofed in time for the 750th anniversary of its foundation. In 1997 The Chapter House and Dorter area was restored and roofed and it is this area in particular that now caters for the thousands of young people who come each year for retreats and Faith Formation Programmes. It is planned to restore the entire east wing of the Abbey during the 800th year celebration in 2016. The strongest tradition is that the Mass has been said in the Abbey without a break since the year of it’s foundation in 1216. We have often heard of the heroic struggle of the Irish people to keep the faith in spite of dungeons, fire and sword. Nothing emphasises this fact more for us than the story of Ballintubber Abbey. 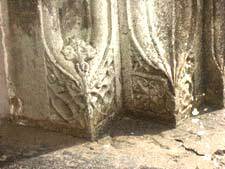 For 236 years the people were attending Mass in the unroofed Abbey exposed to the cold and the wind and the rain. This is not mere conjecture; the photographs of 1865 show the congregation kneeling on the grass covered ground. The priest has finished Mass; the vestments may be seen on the altar while the priest continues the instruction of the children. Though the Mass is over the people still continue to kneel, drinking in the word of God. 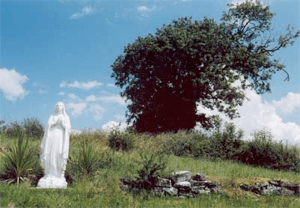 In this modern age of heated air-conditioned churches it is good for us to meditate on what our forefathers endured to practice the faith which Patrick planted so deeply in Baile tobair Phádraig- the townland of the well of Patrick.